Marta Kostyuk not only is a talented tennis player, she's a pretty good gymnast. The Ukrainian sensation, who will turn 16 on Thursday, celebrated her 6-7 (1), 6-3, 9-7 victory over Kristie Ahn (Stanford, 2011-14) in the second round of Wimbledon qualifying today with a backflip. Kostyuk, seeded 23rd, pounded 19 aces and committed 13 double faults in the 2-hour, 41-minute match. The 5-foot-5 (1.65-meter) Ahn, who served for the match twice, had one ace and five double faults. Kostyuk reached the third round of the Australian Open as a qualifier in January in her Grand Slam women's debut. She became the youngest woman to win a match in Melbourne since Martina Hingis in 1996 and the youngest to advance to the third round of a major since Mirjana Lucic Baroni reached the same stage in the 1997 U.S. Open. Fifth-seeded Nicole Gibbs, who played on Stanford's 2013 NCAA championship team with Ahn, advanced to the final round of Wimbledon qualifying with a 6-2, 6-3 victory over Martina Trevisan of Italy. Gibbs, ranked No. 111, won 72 percent of the points on her second serve (13 of 18) and did not face a break point. 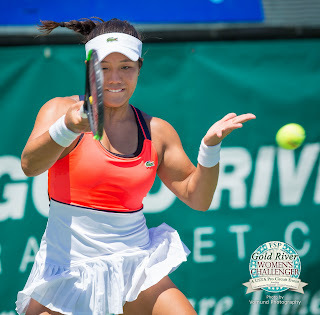 Gibbs, 25, is scheduled to face fellow Southern Californian Claire Liu, 18, on Thursday. Liu, who last year became the first American girl to win the Wimbledon junior singles title since Chanda Rubin in 1992, eliminated Lizette Cabrera of Australia 6-4, 4-6, 6-1. Gibbs edged Liu 4-6, 6-2, 7-6 (5) in the first round of the Bank of the West Classic at Stanford last summer in their only meeting. Also Thursday, 27-year-old left-hander Bradley Klahn (Stanford, 2009-12) is scheduled to play Simone Bolelli, 32, of Italy for the first time in the final round of men's qualifying. Both players had today off. Bolelli won the 2015 Australian Open doubles title with compatriot Fabio Fognini. Gibbs seeks her third main-draw berth at Wimbledon and Klahn his second. Neither has won a main-draw match at the All England Club. Tough loss for Ahn. And I remember that match at BOW, Liu vs Gibbs...it was a great match to watch!